Da Bears Blog | Are Jay Cutler’s stats inflated by garbage time? Are Jay Cutler’s stats inflated by garbage time? On the surface, Jay Cutler appeared to have one of the better years of his career in 2014. He set career highs in completion percentage and touchdowns and had the 2nd highest totals of his career in yards and passer rating. Yet many people have argued that Cutler was actually not good in 2014, for a variety of reasons. For one thing, he threw 18 interceptions, the 2nd most in his career. He also had the 2nd lowest yards per attempt average of his career. But the main knock against Cutler is that he accumulated too many of his stats in garbage time, when the game was already over and teams went into a prevent defense that allowed him easy access to meaningless completions, yards, and touchdowns. I want to dig into the numbers today to see if this argument holds up. Using the database at Pro Football Reference, which lets you sort by game situation, I broke up Cutler’s statistics in 2014 into six categories: up two scores (9-16 points), up one score (1-8 points), tied, down one score, down two scores, and down three or more scores (17+ points). I would have included up three or more scores as a 7th category, but Cutler never attempted a pass while the Bears held a 17 point lead (or greater) at any point in the season. A first glance does seem to indicate that Cutler did indeed rely on some garbage time statistics to buoy his overall numbers. He was at his best when the Bears were down by 3 or more scores, which can typically be described as garbage time, as the game is usually out of reach at this point. Cutler’s completion percentage, yards per attempt, touchdown percentage, and touchdown/interception ratio were all significantly higher than his season averages in these instances. Removing this data from his numbers drops his season stat line from 66.0% completion, 6.8 yards per attempt, 28 touchdowns, 18 interceptions, and an 88.6 passer rating to 65.4% completion, 6.4 yards per attempt, 20 touchdowns, 14 interceptions, and an 85.3 passer rating. In an attempt to visualize how this looks a little better, I’ve set up the following graph, which showcases Cutler’s passer rating, yards per attempt, interception percentage, and touchdown/interception ratio in all the various game situations. 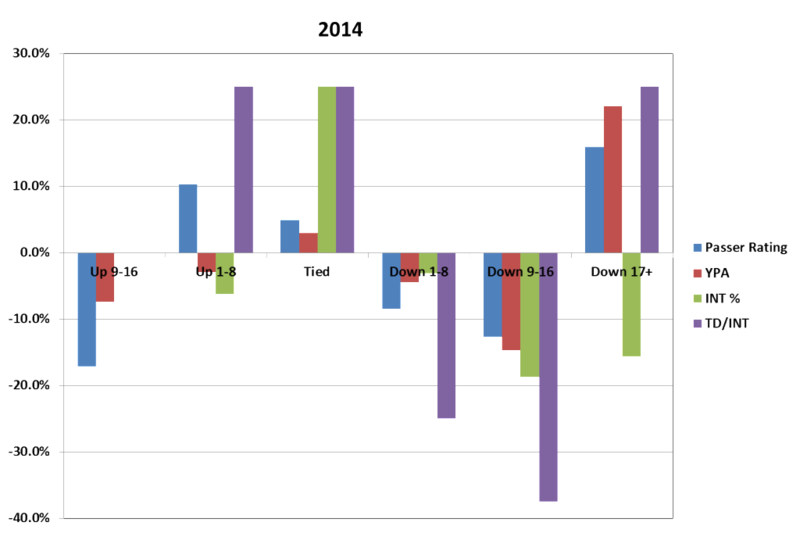 In order to make the scales all the same, I compared their percent difference from the season average. So a passer rating of 102.7 while down by 3 or more scores was 15.9% better than his season average of 88.6, and so on. Note that I set it up so that a lower interception percentage reads as a positive number, because this is the desirable outcome. Here you can visually see that Cutler was at his best when the team was getting blown out, followed by when they were tied or slightly ahead. When the Bears fell behind, his interceptions increased and touchdowns decreased, leading to a plummeting touchdown/interception ratio and lower passer rating. In order to get a better feel for what this type of data normally looks like, I compiled Cutler’s stats for all six of his seasons in Chicago in the same categories. This has an added advantage of greatly increasing the sample size, which decreases the variation from one touchdown or interception in a smaller data set. Here we see a similar trend, but with one important difference: Cutler’s stats when the Bears are getting blown out do not skyrocket like they did in 2014. There seems to be a negative correlation between the team’s situation and Cutler’s performance, which can be visually seen in the graph below. This negative trend is largely driven by interception percentage, which is at it’s three worst levels in the three categories where the Bears are losing. This suggests that Cutler has a tendency to force passes when things aren’t going well, which compounds the problem and leads to further struggles. Conversely, when the Bears have the lead, Cutler can play safer football, and his interception rates tend to be lower. 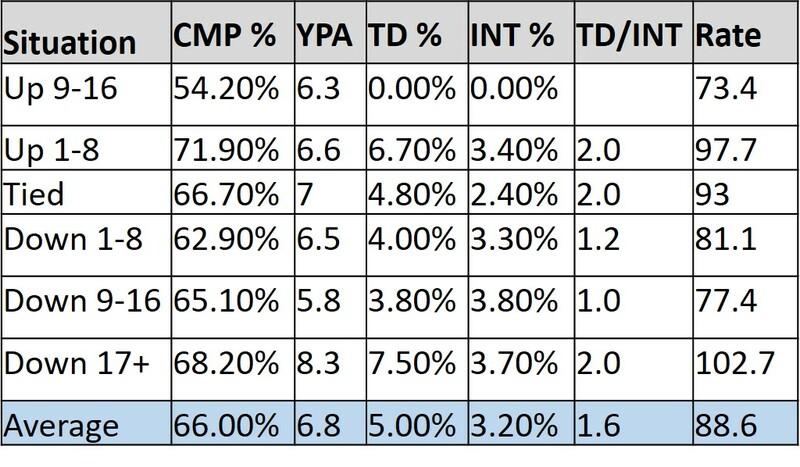 The numbers back up the assertion that Cutler’s performance variation is largely interception based. A regression of interception percentage against drive differential (+1 for up by 1 score, -1 for down 1 score, etc.) gives a correlation of 0.4, while the correlation for completion percentage, yards per attempt, touchdown percentage (the other three stats that go into passer rating) are all 0.1 or lower. Of course, one other factor to consider is that Cutler’s statistics have fluctuated from season to season, and ignoring that can lead to a data bias. For instance, Cutler’s worst season in Chicago was in 2009, when the Bears played from behind more than in some of his better seasons. 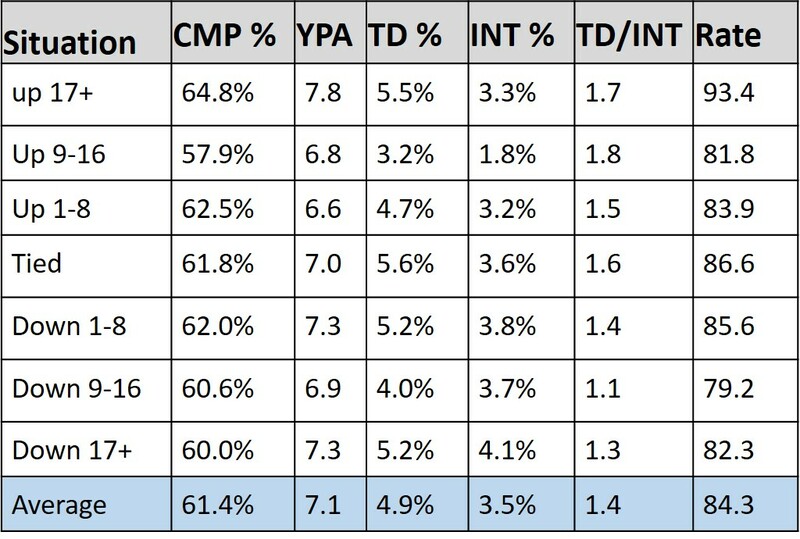 Looking at Cutler’s statistics in each situation compared to the other situations in the same year, therefore, is an important control. The chart below shows that data, looking at how Cutler’s stats in each game situation compare, on average, to his total production from that same season. So across his six years in Chicago, Cutler has had a completion percentage 6.3% higher than his total completion percentage that season when his team is up by 17 or more points. 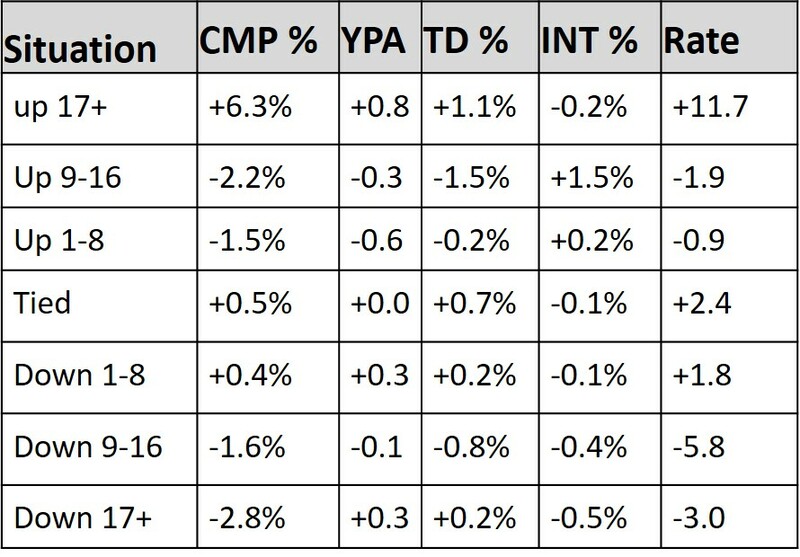 Now we can see a clearer relationship between the game situation and Cutler’s performance, as completion percentage (0.36), interception percentage (0.33), and passer rating (0.45) all have meaningful positive correlations (while yards per attempt and touchdown percentage do not seem to have any discernible pattern). This is nothing shocking; as the team struggles and falls behind, Cutler is forced to throw more, his completion percentage drops, and his turnovers increase, which lowers his passer rating. The numbers back up the notion that Cutler’s statistics were inflated by garbage time production in 2014. 19% of Cutler’s passing attempts came with the Bears down by 3 or more scores, but those passes accounted for 23% of his yards and 29% of his touchdowns (and 22% of his interceptions). 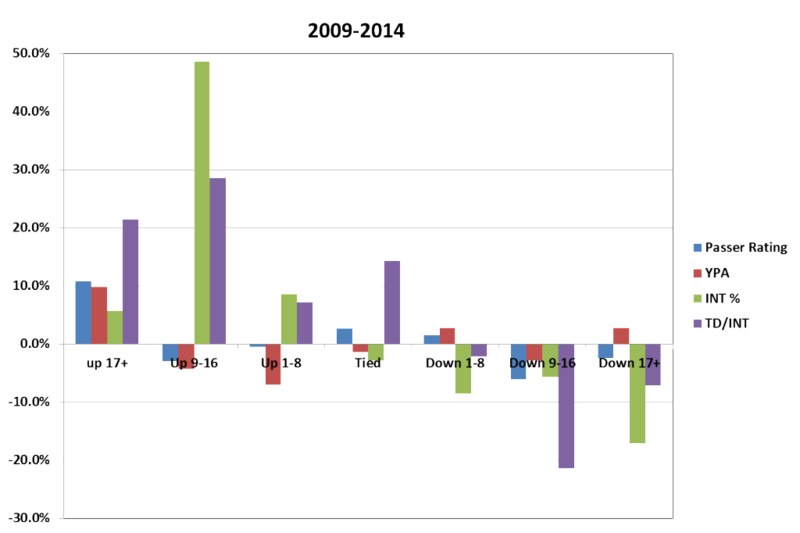 History suggests that is not a typical pattern for Cutler, so 2014 will likely prove to be an aberration. The fact that Cutler’s performance gets worse as the team struggles points to how important it is for the Bears to start well with him under center. When the team plays with a lead, Cutler seems to relax and avoid turning the ball over as much, while he starts pressing and turns the ball over more when they fall behind. So if Cutler is going to continue to be Chicago’s starting quarterback for the next couple years, building early leads (or at least avoiding early deficits) should be a clear goal for the Bears, as Cutler’s turnover tendencies are likely to do nothing but dig a deeper hole once the Bears fall behind.